The GEF's Sustainable Cities Integrated Approach Pilot programme will focus on 28 cities in 11 developing countries across Asia, Africa and Latin America. 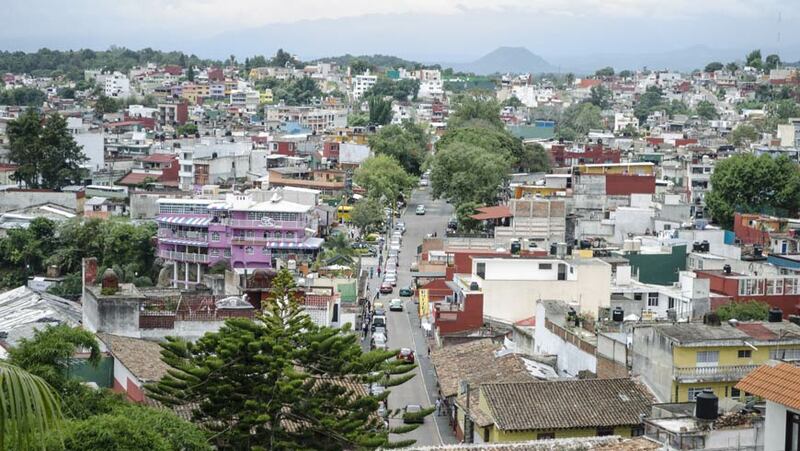 Cities like Xalapa, Mexico (pictured) will benefit from varied improvements in green technology and infrastructure. Humanity, for the first time, has become an urban species. The number of people living in towns and cities has grown more than fivefold since 1950 and a decade ago overtook those living in the countryside. And this dramatic transformation is continuing to accelerate. By 2050 urban areas will have gained another two billion people, and two thirds of humanity - overwhelmingly rural throughout its previous history - will live in them. Nearly 90 per cent of this increase will take place in Asia and Africa. Cities already produce four fifths of the world's GDP, consume over two thirds of its energy and emit nearly three-quarters of its greenhouse gases. The future of the Earth's global commons, as well as its economy, will therefore be decided in them in the next decades. They could pioneer green, low-carbon prosperity or drive the globe even deeper into crisis. Fortunately, many cities, and their leaders, are in the vanguard of combating climate change and implementing sustainable development through such initiatives as the Compact of Mayors, the C40 Large Cities Climate Leadership Group and ICLEI -Local Governments for Sustainability. Now the Global Environment Facility (GEF) is increasingly harnessing that momentum. "If planned and managed well, compact, resilient, inclusive, and resource-efficient cities can drive development, growth, and the creation of jobs, while also contributing to a healthier, better quality of life for residents and the long-term protection of the global environment," said Naoko Ishii, GEF CEO and Chairperson. Few issues can be effectively addressed in isolation, as if in their own silos, and nowhere is this truer than in cities, which can only function as an integrated system. So, the GEF chose them as the basis of an Integrated Approach Pilot programme, addressing environmental and economic issues holistically, within a broad and complex set of development challenges, with a wide array of stakeholders. The programme – which is expected to mobilise $2.4 billion over five years – is focusing on 28 cities in 11 developing countries across Asia, Africa and Latin America. It is taking a two-track approach – both carrying out projects in individual cities, and tying them together into a greater whole through a collaborative global platform where they will exchange knowledge. experience and good practice. Bhopal – scene of one of the worst-ever pollution disasters, which killed thousands of people and injured tens of thousands more in 1984 – is to benefit from one of the projects, carried out by the United Nations Industrial Development Organisation (UNIDO) and funded by the GEF. A huge and notorious open waste dump, which pollutes the air and threatens drinking water supplies, is to be safely closed. Priyanka Das, Commissioner of the Bhopal Municipal Corporation, says that the dump's impact on the health of local residents is “a very serious concern” and that “immediate intervention” is needed. And Katarina Baruncina, the UNIDO industrial development officer responsible for the project says that the drinking water supplies of two million people will benefit from the closure. Meanwhile other GEF projects, implemented by the World Bank, will improve public transport in the city and have already improved the maintenance of its buses, increasing the number on the road and reducing delays caused by breakdowns. The integrated approach programme will also cover the Indian cities of Jaipur, Mysore, Vijayawada and Guntur. All 28 of the cities worldwide are brought together in the World Bank-led Global Platform for Sustainable Cities (GPSC) which aims to make the programme much more than the sum of its parts by enabling cross-fertilisation between participants. It held its second annual conference – attended by 2010 mayors and other municipal officials, academics and business leaders - in late October. At the conference, for example, Yeo Klotioloma, the Vice-Governor of Abidjan, Côte D'Ivoire – who said he was “expecting a lot from this collaboration” - outlined plans to control pollution, invest in new infrastructure, and prepare a rapid-transit bus system to ease congestion and cut emissions. Americo Zuniga, mayor of Xalapa in Mexico, said that his city would pioneer using green technology to manage waste and produce clean energy. Nicole Gemayel, Mayor of Bifkaya-Mhaydsse in the Lebanon, came to see if she could finance a plant to get energy from waste that is at present dumped in the Mediterranean Sea. Toru Hashimoto, Executive Director of the Development Cooperation Department of Yokohama, in Japan, participated to offer ideas and other help. And Maria Silvia Rossi, Sub-Secretary of Environment for Brasilia, was wanting to talk about a water crisis threatening Brazil's capital, calling the GEF platform “an incredible opportunity to understand what other municipalities are doing”. Idris Haron, the Chief Minister of Melaka, Malaysia, said he had found a lot to discuss on “how to make our city sustainable and liveable in the future”. And India announced that was establishing its own platform for sustainable cities, thus demonstrating that the initiative was already proving to be replicable. This article draws on interviews in the GEF film Our Global Commons: Sustainable Cities.